No more shoveling, no more lawn mowing! 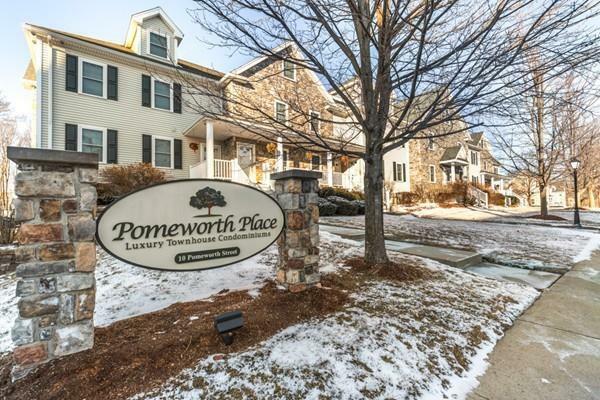 Maintenance free, luxurious tri-level (3 level) townhome at Pomeworth Place. Entertaining is a delight with open concept living room that flows into dining area & kitchen. Tastefully designed kitchen with granite counters, tiled backsplash, under mount lighting, SS appliances & custom maple EZ close cabinetry. Second floor hosts master bedroom with ensuite & walk-in closet, second bedroom, full bath & laundry. Third floor can be used as 3rd bedroom, media room, game room, home office, great room--the possibilities are endless! Additional features include, gas FP, central air, deeded, heated garage parking with storage room, common yard, BBQ area, front porch, fitness room and security cameras. Located close to shops, theater & restaurants plus only 12 miles to Boston. Rte 93, 128 & 28 all nearby. This building is meticulously maintained.